West Antarctic Ice Sheet: Current conditions affecting the West Antarctic Ice Sheet are sufficient to drive between 1.2 and 4 metres of sea rise, and these glaciers are now in "unstoppable" meltdown at global average warming of just 0.8 ºC (NASA, 2014A; Rignot, Mouginot et al., 2014; Joughin, Smith et al., 2014). Loss of summer Arctic sea-ice: Because climate models generally have been poor at dealing with Arctic sea-ice retreat (see summary of literature at Spratt, 2013), expert elicitations play a key role in considering whether the Arctic has passed a very significant and “dangerous” tipping point, including Steffen (quoted by Cubby, 2012), Livinia and Lenton (2013), UWA (2012), Serreze (quoted by Romm, 2012), Wadhams (2012; quoted by Vidal, 2012), Maslowski, Kinney et al. (2012) and Laxton (quoted by McKie, 2012). Duarte, Lenton et al. (2012) find that: “Warming of the Arctic region is proceeding at three times the global average, and a new ‘Arctic rapid change’ climate pattern has been observed in the past decade.” Reductions in the sea-ice cover are believed to be the largest contributor toward Arctic amplification. Maslowski, Kinney et al. (2012) note that: “a warming Arctic climate appears to affect the rate of melt of the Greenland ice sheet, Northern Hemisphere permafrost sea-level rise, and global climate change.” It is worth noting that one month of sea-ice-free summer conditions in the Arctic each year would add approx. 0.2 °C to global warming (Hudson, 2011), an event that though credible in the next few decades is not taken into account in any carbon budget modelling. Greenland Ice Sheet (GIS): Current-generation climate models are not yet all that helpful on GIS. They have a poor understanding of the processes involved, and acceleration, retreat and thinning of outlet glaciers are not represented (Maslowski, Kinney et al., 2012). Estimated tipping point for GIS is +1.6 ºC with an uncertainty range of +0.8 to +3.2 ºC (Robinson, Calov et al., 2012). A recent study finds that deep canyons will contribute to more rapid GIS deglaciation (NASA, 2014B; Morlighem, Rignot et al., 2014). Contrary to previous studies, that estimated it would take centuries to millennia for new climates to increase the temperature deep within ice sheets such as GIS, the influence of melt water means warming can occur within decades and produce rapid accelerations (Phillips, Rajaram et al., 2013; University of Colorado Boulder, 2013). As well, "rapid iceberg discharge is possible in regions where highly crevassed glaciers are grounded deep beneath sea level, indicating portions of Greenland and Antarctica that may be vulnerable to rapid ice loss through catastrophic disintegration” (Basis and Jacobs 2013). Informally, many leading cryosphere scientists say the GIS has passed its tipping point, "is already lost" and similar sentiments (pers. com.). With Arctic amplification of around three times average global warming, it is hard to conceive that GIS deglaciation will other than continue to accelerate as reflectivity declines, and late-summer ocean conditions become ice-free. In 2012, then NASA climate science chief James Hansen told Bloomberg that: “Our greatest concern is that loss of Arctic sea ice creates a grave threat of passing two other tipping points – the potential instability of the Greenland ice sheet and methane hydrates… These latter two tipping points would have consequences that are practically irreversible on time scales of relevance to humanity” (Morales, 2012). Coral reefs: “Preserving more than 10% of coral reefs worldwide would require limiting warming to below +1.5 °C (atmosphere–ocean general circulation models (AOGCMs) range: 1.3–1.8 °C) relative to pre-industrial levels” (Frieler, Meinshausen et al., 2013). At 10%, the reefs would be remnant, and the ecosystems as we know them today would be a historical footnote. Data suggests the area of reef systems has already been reduced by half around the world. Permafrost: In February 2013, scientists using radiometric dating techniques on Russian cave formations to measure melting rates warned that a 1.5 ºC global rise in temperature compared to pre-industrial was enough to start a general permafrost melt. Vaks, Gutareva et al. (2013) found that “global climates only slightly warmer than today are sufficient to thaw extensive regions of permafrost.” Vaks says that “1.5 ºC appears to be something of a tipping point.” In May 2013, Brigham-Grette, Melles et al., (2013) published evidence from Lake El’gygytgyn, in northeast Arctic Russia, showing that 3.6–3.4 million years ago, summer mid-Pliocene temperatures locally were ~8 °C warmer than today, when CO2 was ~400 ppm (a similar level to today). This is highly significant because researchers say the tipping point for large-scale permafrost carbon loss is around +8–10ºC regional temperature increase (Bitz, Ridley et al, 2009). As well, research from Ballantyne, Axford et al. (2013) finds that during the Pliocene epoch, when CO2 levels were ~400 ppm, Arctic surface temperatures were 15–20 °C warmer than today’s surface temperatures. Soon to be published work by Shakhova and Semiletov, as a follow-up to their 2013 paper on shallow-water, sea-floor sediment cores on the East Siberian Arctic Shelf, finds the ocean floor permafrost layer at "thaw point" temperature and "slushy" (pers. com. ), suggesting vulnerability of the underlying methane hydrate stability zone, in the area where vast new methane plumes in the ocean are being observed in the 2014 northern summer (Papadopoulou, 2014). Figure 2. 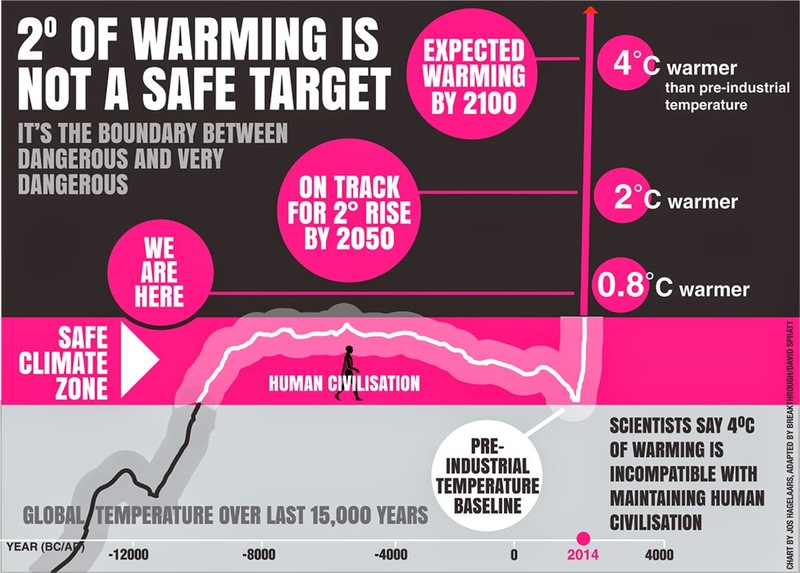 2 °C of warming is not a safe target. The temperature reconstruction of Shakun, Clark et al. (2012) and Marcott, Shakun et al. (2013) is combined with the instrumental period data from HadCRUT4 and model average of IPCC projections for the A1B scenario up to 2100. In summary, there is a very high risk that further significant tipping points will be passed before warming reaches 2 °C. Some of these are irreversible on time scales of centuries to a millenia. The failure of international climate negotiations and insufficient national efforts have led many negotiators and commentators to conclude that warming will not be held to 2 ºC and much higher warming is likely. This has resulted in a policy approach of still trying to reduce emissions (mitigate) for 2 ºC, whilst also planning to adapt to 4 ºC of warming. World Bank (2012) and Price Waterhouse Coopers (2012) reports complement a range of research that suggests the world is presently heading for 4 ºC or more of warming this century. Global average warming of 4 ºC means around 6 °C of warming over land, and perhaps 7–8 °C at the extremes. IEA Chief Economist Fatih Birol says that emission trends are “perfectly in line with a temperature increase of 6 °C, which would have devastating consequences for the planet” (Rose, 2012). Climate researcher Rachel Warren says, “In… a 4 °C world, the limits for human adaptation are likely to be exceeded in many parts of the world, while the limits for adaptation for natural systems would largely be exceeded throughout the world. Hence, the ecosystem services upon which human livelihoods depend would not be preserved. Even though some studies have suggested that adaptation in some areas might still be feasible for human systems, such assessments have generally not taken into account lost ecosystem services” (Warren, 2010). Professor Neil Adger says, "Thinking through the implications of 4 °C of warming shows that the impacts are so significant that the only real adaptation strategy is to avoid that at all cost because of the pain and suffering that is going to cost... 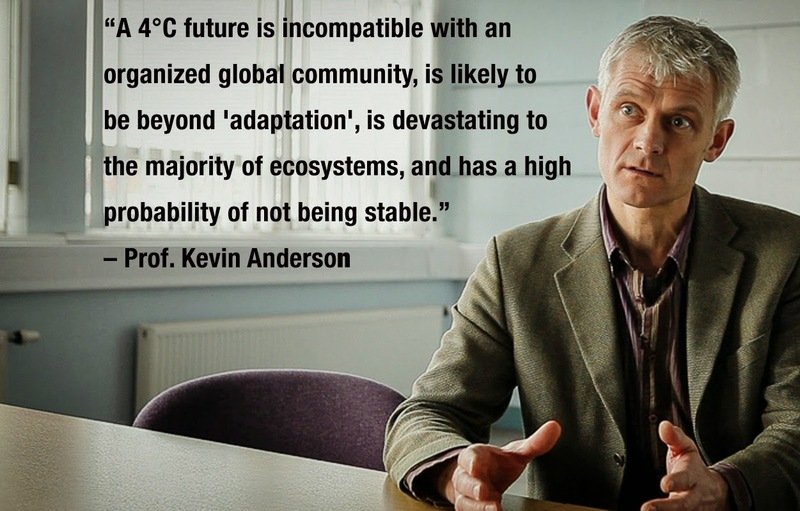 There is no science on how we are going to adapt to 4 °C warming. It is actually pretty alarming" (Randerson, 2008). At 4 °C hotter, the world would be warmer than during any part of the period in which modern humans evolved, and the rate of climate change would be faster than any previously experienced by humans. The world's sixth mass extinction would be in full swing. In the oceans, acidification would have rendered many calcium-shelled organisms such as coral and many at the base of the ocean food chain artifacts of history. Ocean ecosystems and food chains would collapse (literature surveyed by Spratt, 2011). Warming of 4 ºC is sufficient to melt the polar ice sheets and produce 70 metres of sea-level rise over a longer period of time (Hansen, Sato et al., 2013). The carbon budget has come to public prominence in recent years, including in the IPCC’s Fifth Assessment Report in 2013, as being the difference between the total allowable greenhouse gas emissions for 2 °C of warming, and the amount already emitted or spent. The 2 °C cap: A cap is an upper boundary, not to be exceeded. This is implicit in international agreements such as the Copenhagen Accord and Cancun Agreements which aim to “hold the increase in global average temperature below 2 °C, and to take action to meet this objective consistent with science and on the basis of equity” and the position of the European Commission in 2007, to “ensure that global average temperatures do not exceed preindustrial levels by more than 2 °C” and to “adopt the necessary domestic measures… to ensure” this is the case (emphasis added). This language implies a very low probability of exceeding the target. This is consistent with the approach taken in catastrophic risk management, where the risk of failure must be very small (Dunlop, 2011). 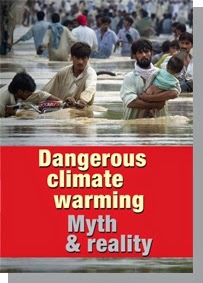 Climate change with its non-linear events, tipping points and irreversible events – such as mass extinctions, destruction of ecosystems, the loss of large ice sheets and the triggering of large-scale releases of greenhouse gases from carbon stores such as permafrost and methane clathrates – contains many possibilities for catastrophic failure. The 2 °C target: A target can be overshot; in common parlance, we may “miss the target.” This is the language employed for the carbon budget, where misses are part of the target calculations. The IPCC gives carbon budgets only for 33%, 50% and 66% chances of keeping to 2 °C (IPCC, 2013). Higher probabilities of achieving the target were not reported. The most stringent — at 66% — has a one-in-three chance of exceeding the target, and a range of outcomes from 1 °C to 3.1 °C (with 95% confidence). Figure 3. 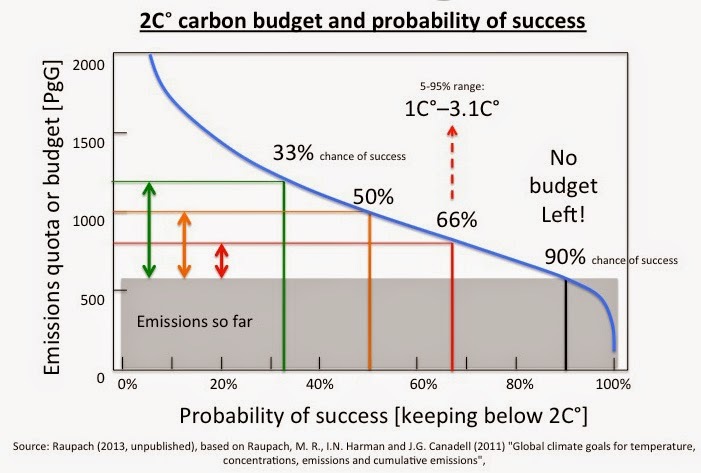 The carbon budget and probability of success. The budget (vertical axis) is related to risk of failure (overshooting the 2 °C) (horizontal axis) along the blue curve. Emissions to date are indicated by grey box, leaving the available budget as the distance between the blue curve and grey box. As chance of not exceeding the target increases from 33% (green) to 50% (orange) to 66% (red), the budget decreases. At 90% chance of not exceeding the target (black), no carbon budget remains. For the 2 °C cap, and a risk-averse (low probability of less than 10%) approach of not exceeding the target, there is no carbon budget left for the 2 °C target: "…the combination of a 2 °C warming target with high probability of success is now unreachable" using the current suite of policy measures, because the budget has expired (Raupach, Harman et al., 2011; Raupach, 2013). See Figure 3. "[T]o provide a 93% mid-value probability of not exceeding 2 °C, the concentration would need to be stabilized at, or below, 350 ppmv CO2e, i.e., below current levels" (Anderson and Bows, 2008). If some reasonably optimistic assumptions are made about deforestation and food-related emissions (halving per unit of production) for the rest of the century, then most emission reduction scenarios are incompatible with holding warming to 2 °C, even with a high 50% probability of exceeding the target, and there is no budget left for fossil fuel emissions (Anderson and Bows, 2008). Accounting for the possible release of methane from melting permafrost and ocean sediment implies a substantially lower budget, but this was not done (IPCC, 2013). There are no such things as an 'allowable carbon dioxide (CO2) emissions.' There are only 'damaging CO2 emissions' or 'dangerous CO2 emissions.' Every CO2 emission causes additional damage and creates additional risk. Causing additional damage and creating additional risk with our CO2 emissions should not be allowed. If you look at how our politicians operate, if you tell them you have a budget of XYZ, they will spend XYZ. Politicians will reason: 'If we’re not over budget, what’s to stop us to spending? Let the guys down the road deal with it when the budget has been exceeded.' The CO2 emissions budget framing is a recipe for delaying concrete action now (Caldeira, quoted by Romm, 2013B). Finally, we need to remember that the current level of greenhouse gases is already enough for more than 2 °C of warming, though some gases such as methane are relatively short-lived in the atmosphere. Ramanthan and Feng (2008) calculated that the observed increase in the concentration of greenhouse gases (GHGs) since the pre-industrial era has most likely committed the world to a warming of 2.4 °C (within a range of +1.4 °C to +4.3 °C) above the pre-industrial surface temperatures.